Oh we Brits love a bit of royal history. Henry VIII and his six wives, the rivalry between the stoical English Elizabeth I and her rather more flirty Scottish cousin Mary, Queen of Scots, the scandalous relationship between King Edward VIII and Mrs Simpson (where rumour has it that her unsuitability was as much about being an American divorcée as being an American divorcée), the Madness of King George III, the tragedies of Princess Charlotte (the queen who never was) and Margaret, Maid of Norway (Queen of Scots for only four years and who died young before she could set foot in her kingdom), the Union of the Crowns, the English Civil War, the restoration of Charles II…it goes on! Even today, stick a picture of certain royals on the front of a magazine and you’re pretty much guaranteed an uptick in sales. And in about five weeks, I’m pretty confident that this country’s media will be going into overdrive…I’m sure you can guess why! What is also clear is that the world of British food also has many links to royal history, with a range of dishes associated with various monarchs. It is probably a bit of a stretch to suggest that any of these were actually made by any of them, but such recipes would tend to be made either to commemorate a special occasion (such as the famous checked Battenberg cake created for a royal wedding) or, as is the case with the subject of today’s post, the Victoria Sponge, were a favourite of a king of queen. Here it is in all its jammy glory! 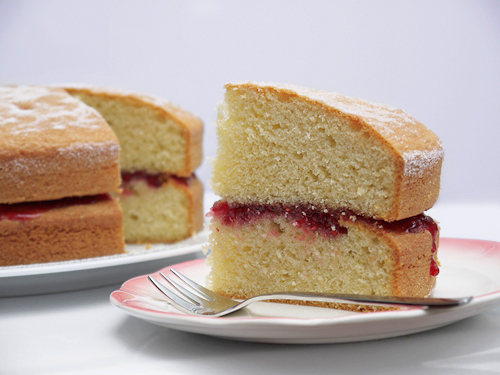 This cake is part of a classic afternoon tea – it’s a fairly simple sponge cake, flavoured with vanilla if you like, then filled with jam and finished with a dusting of caster sugar. You could dust with icing sugar, but the caster sugar adds some sparkle and a little crunch on top. Where there is some debate is what exactly the filling should be. I like raspberry jam and nothing else. However, it’s not uncommon to see whipped cream or even buttercream in the middle of this cake. I think that makes it all a bit too rich, but to each his own. 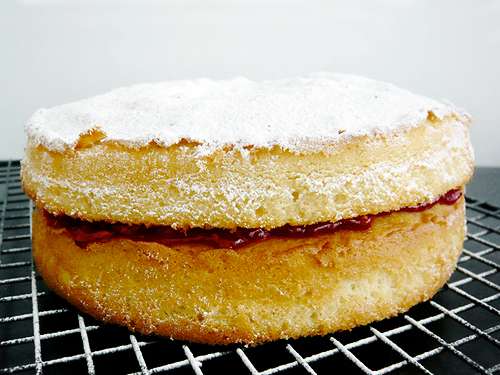 If you were to add the cream, then I would just caution you and suggest it should be added at the last minute, so that the cream does not make the cake go soggy (or cheat – coat the top of the base and the bottom of the top cake with jam, which should stop the cream getting to the cake). The method I’ve used here is essentially the all-in-one technique. You can do it the hard way (cream butter, beat in the sugar, mix in the eggs, fold in the flour…), but I’ve tried both approaches, and the all-in-one produces great results with minimal fuss. The secret to getting this cake as light as possible is to use self-raising flour, and then to boost it with some baking powder. I’m willing to guarantee that if you follow the recipe, perfect results can be yours! If you’re not sold on the idea of keeping things simple, you can try different types of jam, or even use lemon or orange curd. Citrus zest or a handful or currants can be added to the batter too, but as for the topping – go with the simple sprinkling of sugar. Do that, and I’m sure Queen Victoria would approve. 1. Preheat the oven to 180°C (350°F). Butter two 20cm (8 inch) sandwich tins, coat with flour and line the base with greaseproof paper. 2. Cream the butter in a mixing bowl until soft and fluffy. Add the caster sugar, eggs, vanilla, flour and baking powder, and mix well until just combined (don’t over-beat). Divide the mixture between the two sandwich tins. Smooth the tops with a fork. 3. Bake the cakes for 25 minutes until risen and golden, and an inserted skewer comes out clear. Allow to cool in the tins for 10 minutes, then remove form the tins, place on a wire tray and allow to cool completely. 4. To assemble the cake, remove the greaseproof paper from the bottom cake. Trim any peak if necessary, then spread generously with jam. Remove the paper from the bottom of the second cake, and place on top. Sprinkle lightly with caster sugar. Voila! Worth making? 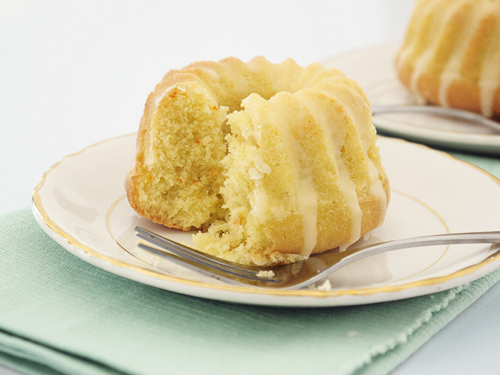 This is a simple, but always-popular cake, which is easy to make. Highly recommended with a cuppa! 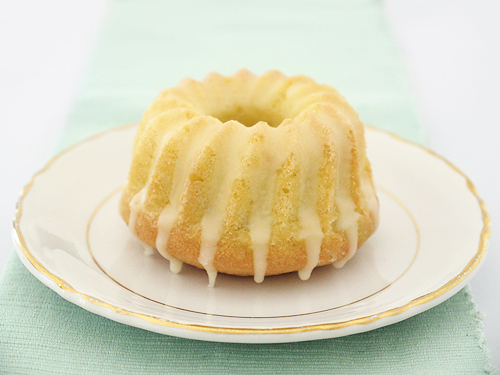 Today’s regal bake-fest involves dainty little morsels called Queen Cakes. In spite of their very grand-sounding name, they are actually rather simple, and they are the perfect addition to an afternoon tea spread or to serve at a street party. However, I must confess that I don’t know the origin on the name – some suggest they were created for a queen consent, others suggest they were seen as the height of refinement (the “queen of cakes”) or that this was just a generic name for small, individual cakes before the rise of the cupcake. 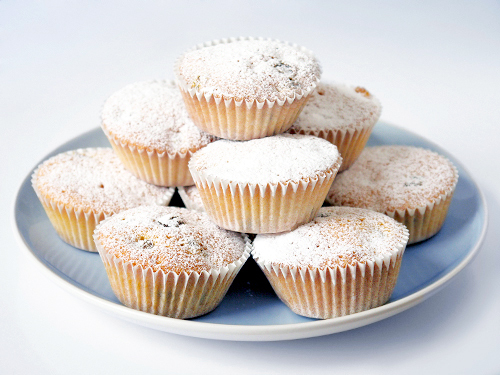 These are simple small sponge fairy cakes that have been livened up with some sultanas or other dried vine fruit. No glaze, no icing, no mountains of fluffy pink buttercream. If you want to make them look fancy, just dust very lightly with icing sugar. I suppose you could think of them as the dignified understated and queenly addition to the tea-table in comparison to the cupcake’s gaudy courtesan or the scheming French court ambassadress as typified by the macaron. 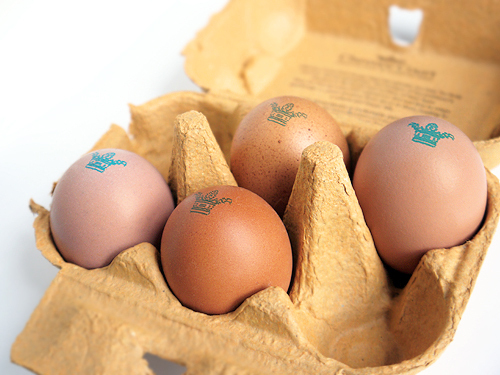 I was pleased as I started to make these cakes that the eggs I had bought had decided add a crown stamp to the shells. A nice touch, yes? The recipe here is very similar to Victoria sponge and would traditionally have required a large bowl, strong arms and a fearsome command of the hand whisk. Baking powder is a relatively recent invention, so the cook in olden days had to rely on getting lots and lots of air incorporated into the mixture. Fortunately, we can rely on creaming the butter and sugar, then adding the eggs and flour, but letting the baking powder in the self-raising flour take the strain. Whew! These cakes would, in the past, have been baked in special pans, and if a heart shape was used, they were called heart cakes. Luckily, we live in a more modern world, and the convenience of the paper case makes these cakes a breeze, but I think they would still be rather nice if you can find some appropriately shaped silicone moulds. As I mentioned, this is quite a straightforward recipe that does not need much adornment. However, if you want to make these cakes a little more fancy, I would suggest adding a dash of spice (nutmeg or mace would hint at the Regency kitchen), or soak the sultanas overnight in rum. 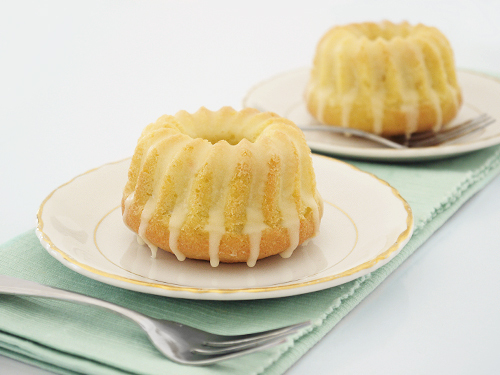 Alternatively, you could prepare a simple water icing and brush over the warm cakes. Anything more might be a bit too flashy, and that would never do, would it? As you can see, the finished results look rather nice when piled up high on the tea-table. These are what I’ll be contributing to a Jubilee weekend picnic, along with a couple of pitchers of Pimm’s punch. Cheers! Preheat the oven to 190°C. Line a muffin tray with small paper cases. Put the butter and sugar into a bowl. Mix well (best to use an electric beater) until light and fluffy. In another bowl, whisk the eggs, then add, a little at a time, to the butter mixture, beating well after each addition. Add the salt and vanilla. Fold in the flour, then stir in the sultanas. Divide the batter between the cake cases and bake for around 15 minutes, until golden and risen, and an inserted skewer comes out clean. Leave to cool, then finish with a dusting of icing sugar. Worth making? These are lovely little cakes, and make a change from very fancy, rich cupcakes. Great with a cup of tea mid-afternoon. 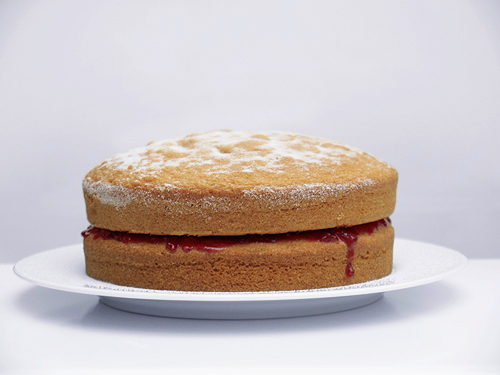 I’ve very happy to see that this piece in The Guardian seems to share my views (my post here) about the wonders of the Victoria Sponge! It’s Election Day! The rosettes are out, the babies have been kissed, and now just sit back and wait for the result. I was asked to take something along to an election day event, and what could be more fitting than a Victoria Sponge, probably the classic British cake? 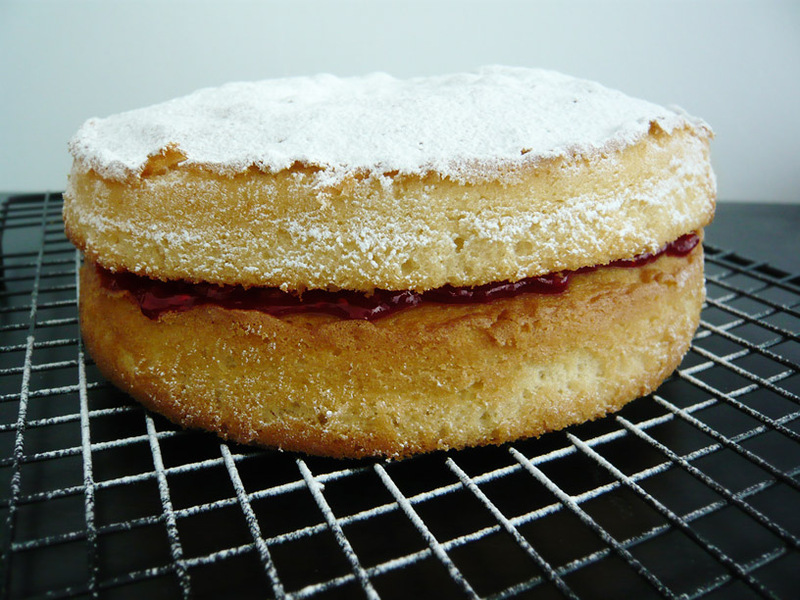 Simple sponge, filled with jam and cream, and topped off with a dusting of icing sugar. Nothing fussy, no unnecessarily dramatic flourishes, just good, honest cake and a nice filling. It was named, not unsurprisingly, after Queen Victoria in view of her apparent fondness for this cake. If you want to open a decent tea shop, you need this one, and it needs to be done well. Once baked, fill the cooled cake with good jam. Raspberry or strawberry are the classics, but there is nothing to stop you going freestyle and using something different – damson, plum, gooseberry – or even a decent, sharp lemon curd. You can also add some whipped cream. Not everyone does this, but I usually do. I’ve seen this cake done with buttercream icing, and while it looks the same as cream, I think buttercream is too sweet. Stick with the cream. Britain usually equals tradition, and this is one tradition that I agree with. If you use the cream, it is also worth letting it sit in the fridge for a little while once filled, so the cream firms up a little and does not squirt out of the sides when you cut it. Finally, dredge the top with icing sugar. Some cooks use caster sugar, but I prefer the white powdery look. Just, whatever you do, avoid smearing the top with buttercream icing. This is a simple classic, so don’t mess with it and try to make it look like a giant cupcake. I don’t like to preach about food, but this is one point I’m pretty firm on. Just think – what would Victoria have said? I’ve written before about people turning to British classics. Old favourites have been knocking about on the pudding menus of London’s top restaurants for a while now, and indeed it might be time to look at more exotic fare (Japanese, anyone?). But I think our cake heritage is coming into its own. Fits the “Keep Clam and Carry On” ethos of now. The Victoria Sponge obviously taps into this tradition of British teatime cakes, but another reason that I like it is that it makes a change from cupcakes. Good cupcakes are nice, but the naff things seem to be everywhere at the moment, and all too often badly made with sickening icing, odd novelty toppings and suspiciously fake looking colours. 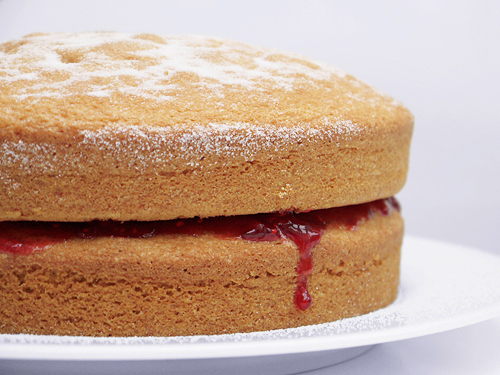 A decent Victoria Sponge will knock them all for six and makes a superior accompaniment to a cup of tea in the sunshine in the park. Preheat the oven to 180°C, and line two 20cm cake trays with greaseproof paper (bottom and sides). Cream the butter and sugar until fluffy. Add the eggs one at a time, including two spoonfuls of flour with each, and beating well after each addition (this keeps the mixture smooth and light). Add the vanilla and beat well. Sift the remainder of the flour into the mixture, and mix well. At this stage, we want the mixture to fall very slowly off the back of a spoon. It should not be anything near runny. Add milk, a spoonful at a time, until the consistency is right. Spoon the mix into the two trays and smooth the tops. Bake for 20-25 minutes until golden and risen. 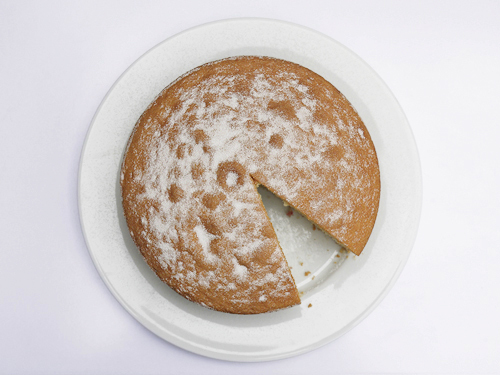 Test the cakes by pressing very gently – they should spring back – and inserting a skewer – it should come out clean. If not ready, bake for a few more minutes and test again. Once cooked, remove from the oven and allow to cool 5 minutes in the pan, and then place on a cooking rack and allow to cool completely. To complete the cake, even off the base cake (i.e. cut it flat) and spread its top with good-quality jam (6 tablespoons), and then cover with 300ml of whipped double cream. Add the second layer of the cake, and dredge the top with icing sugar using a sieve. Worth making? This is a really easy recipe and is delicious. It’s a great part of a summer tea or picnic, and is super easy to make. No separating eggs, not preparing meringue, no piping. If you are really in a hurry, make life easy and just throw everything in a bowl and combine well (a mixer is useful here). Definitely worth having this one up your sleeve. 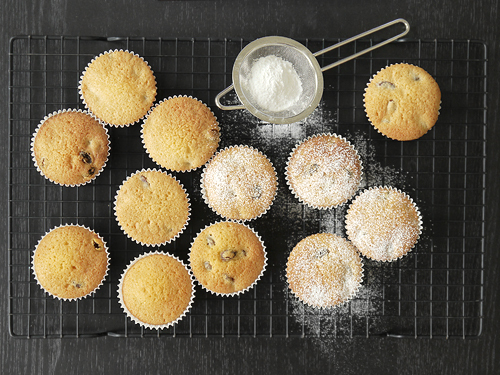 This also serves as a good recipe for fairy cakes (not giant cupcakes!) – just take them out of their cases, split and fill with jam and cream for mini-Victorias!